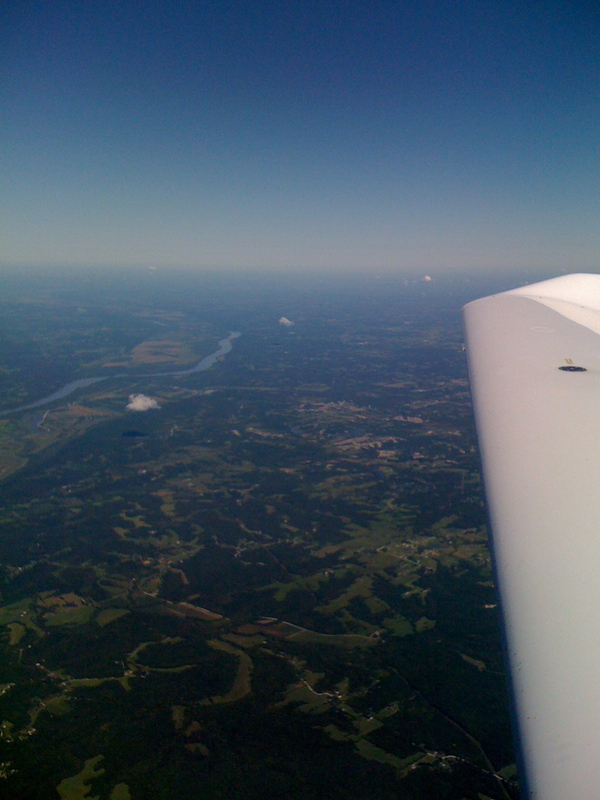 This was one of my favorite days of flying. It wasn’t easy, but it was an adventure and the whole family saw a lot of country that we would never see otherwise. We made it out to the plane early in the morning, before 9am. (There was a fun breakfast place in Jackson Hole that had a long line and fresh baked goods for your breakfast. That’s the sort of place you should have breakfast in when you are only spending one night in a town.) As our taxi drove us out to the airport, we went past the Elk Refuge. The driver explained that in the winter the elk migrate down onto the valley floor. In the spring their antlers molt off and drop to the ground. The boy scouts all come out in a pack, gather up the antlers and sell them in town. They use the funds to buy food for the elk. So, in some sense, the elk are self-sustaining. And a tourist draw. We climbed in and fired up. It was a long taxi to get to runway one-nine, which runs downhill and points back toward town. It is a mile and a quarter long. Fully loaded, at over a mile above sea level, at 9:30am on the last day in July, it took a quarter mile to climb to fifty feet. The air was thin and the propeller had less to bite, so performance was, politely, “anemic.” We flew upwind almost to the town, turning and making a long downwind back past the airport. We saw no elk in the refuge, they are all up in the mountains in the summer, getting fat for their winter, but the valley is beautiful plains of grasses and small groups of trees. Diamondstar, but we just made a gentle turn to the east to follow Route 26 out of the Rockies toward Casper, Wyoming. We were at 9,500 feet, but that was often less than three thousand feet above the highway we followed. There was already a little wind over the mountains and when a downdraft caused us to lose a little altitude we slowed considerable trying to regain the lost feet. It took an hour and a half to make it out of the Rockies. We went by some breathtaking scenery. Mountains scraping the sky, clawing at the clouds sliding over their peaks. Below us long lines of cars labored up the incline, a lot of them filled with summer tourists, I’m sure, gawking at these granite monsters to either side. We glided overhead, wings tipped occasionally by the wind off the monsters’ tops. 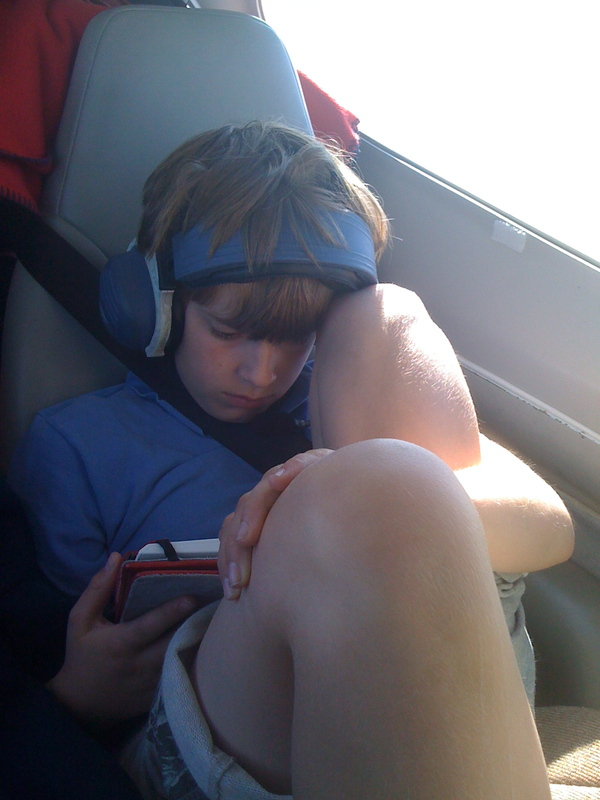 On these long days of flying, the boys have their Kindles in the back. Rudy has a whole slew of Piers Anthony books (the Xanth series, I think there are over twenty of them; he read six or seven over the summer) and Dexter was laughing his way through the Darwin Awards. When they weren’t sight-seeing they were very content reading their books and listening to Broadway show tunes on the XM radio. Casper was originally a fuel stop, but we had a tailwind and made such good time we cut the corner a little and pressed on. 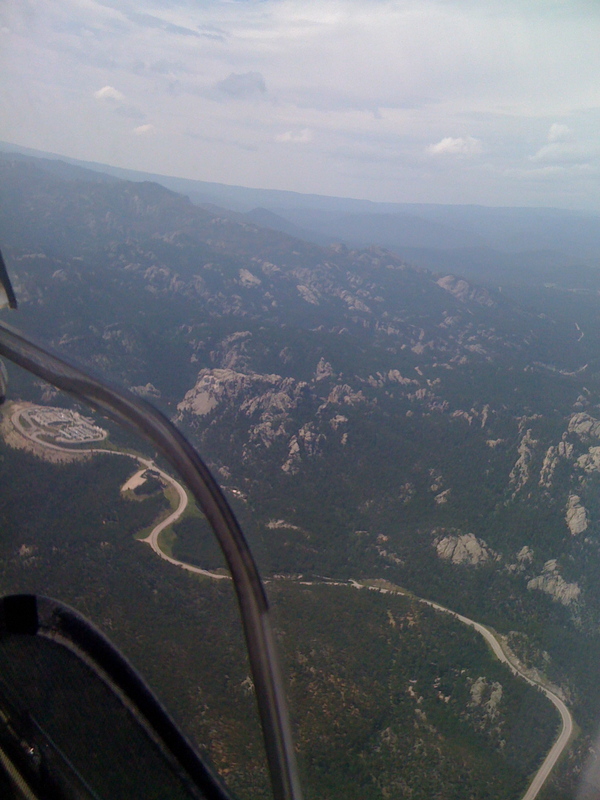 Our next stop was right around lunch time and we were going to land in Rapid City, South Dakota. That’s the town closest to the Mount Rushmore monument. I wasn’t interested enough to drive an hour from the airport to see it, but I certainly wanted to fly past it. It was just like being in a station wagon looking for a landmark. I asked the air traffic controller if we were close and he gave some instructions (“Stay above 3,500 MSL, south of the entry road and parking structure, it’s five miles at your one o’clock.”). Everyone had their eyes peeled and neck craned. We were quite a bit higher than most of the foothills around us, but finally, there it was! One man’s determination to turn nature and history into a huge piece of art. My favorite detail is the way Roosevelt’s glasses are implied. Winds were intense at the Rapid City airport. There was a summer thunderstorm blowing in from the north west, sweeping across the Black Hills. We had thirty-five knots gusting to fifty almost directly down the runway. 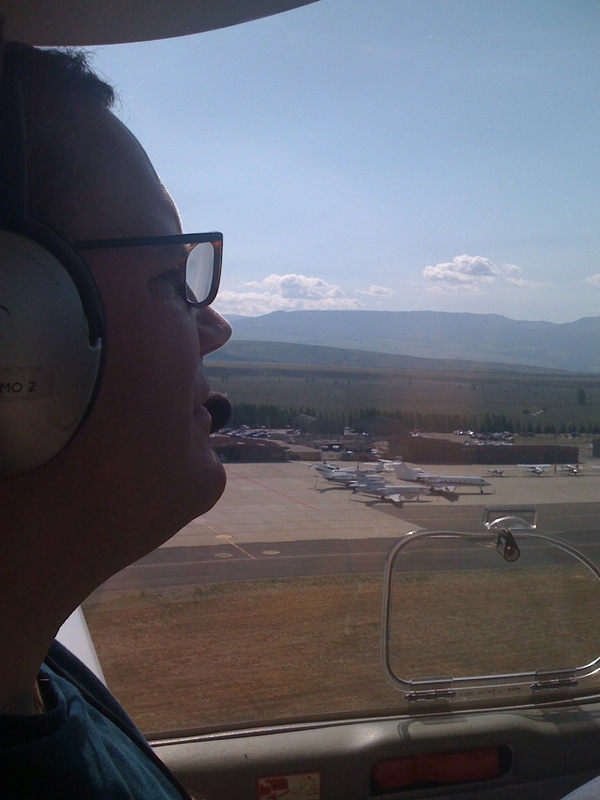 I danced on the rudder pedals and kept the nose right on the centerline. It was very bumpy down the final approach to the numbers, and even once on the ground the plane kept trying to jump back into the air. There are rules about how to keep the control surfaces set when taxing in high wind and I was using those (“Climb away from the wind, dive into it,” is the main mantra). 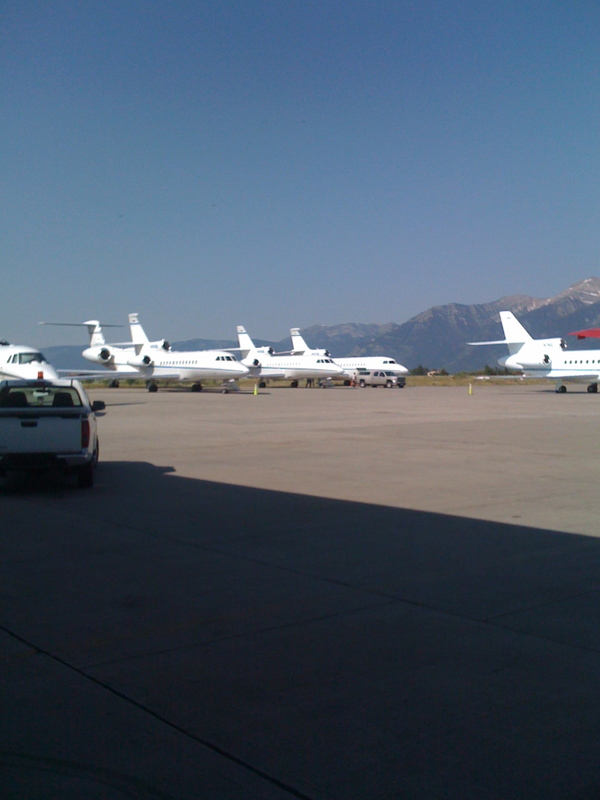 Parking at the FBO, we climbed out. The tail is heavy without me in the front seats, so the airplane tipped back on its tail. That put the wings in a position to generate lift and a lineman from the FBO jumped up and put his weight on the nose. He was there for pretty much the whole time were were on the ground. Inside, the boys used the bathroom and Nell and I discussed plans. I showed her the radar scan, and the storm coming in. If we stayed in Rapid City we were almost certainly there for the night. It might be a nice place to be stuck (since then I have read more about the town and I sort of wish we had stayed), but we certainly hadn’t made a lot of progress toward New Hampshire. We decided to press on and watch the weather from the comfort of the cockpit, and figure out a good place to set down for a late lunch/early dinner. The boys had some snacks out of the vending machine, I tipped the lineman for draping himself on the nose of the plane, and we climbed back into our fully-fueled plane. Taxing downwind was a little nerve-wracking. The strong gusts shook the little plastic plane (well, carbon fiber, just like the new Boeing Dreamliner). It felt like it wanted to push the tail up (which would be nose down, not a comfortable feeling as we mosey along the taxiway). “Dive into, climb away…” I kept repeating to myself. Rolling out onto runway three-two, I looked down the mile and a half of concrete. There’s no way we were going to use more than a thousand feet in this sort of wind. Sure enough, the moment I released the brakes, opened the throttle and applied the lightest back pressure on the control stick N971RD leapt into the air. We were more than a hundred feet up before we were over the thousand foot markers. I saw storm clouds directly ahead and we turned right, eventually completing a turn all the way to the south. The storm was moving at about forty knots and was a line of thunderstorm cells fifty miles long. They were joining together in a single line and getting fatter as they collect moisture in the heat of the afternoon. 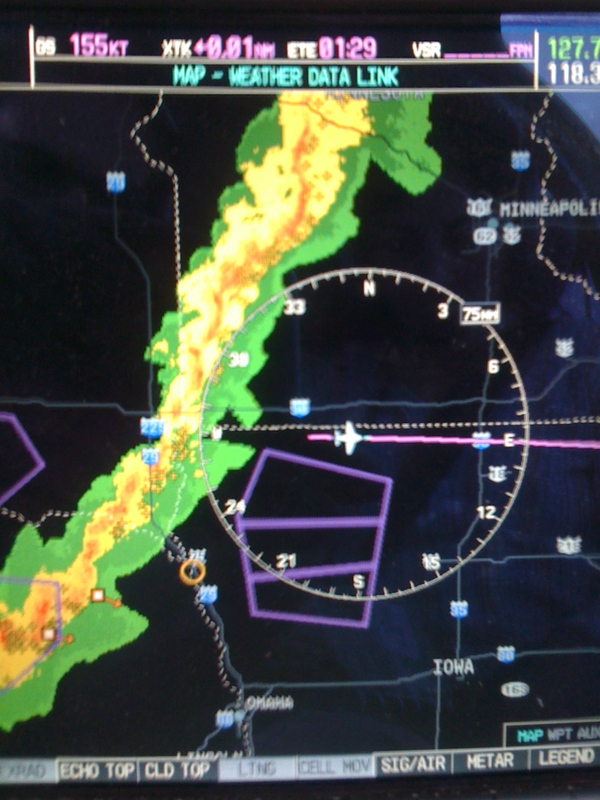 We dashed ahead of it across South Dakota at over a hundred thirty knots. Poking through the database of airports, and cross-checking with our little brown book (the Airport Guide), we decided that Sioux Falls looked like a good bet for a big meal. Two hours later we landed and Landmark Aviation tied the plane down nice and snug. I asked for a good place for a solid meal and they gave us directions to the Outback Steakhouse. They loaned us a car and started refueling us. We weren’t sure that we would stay the night in town or not. I grabbed a business card on my way out. Outback was definitely what the boys needed. A nice big piece of steak and some french fries. Near the end of the meal I glanced up at the television in the bar and noticed that they were showing the weather radar and talking about the huge thunderstorm line that was approaching. I called the FBO and asked them to put the plane in the hangar. I didn’t want it sitting out for hail and torrential rain. After a short discussion with Nell, we decided to head back to the airport to plan the next step, which might be picking out a hotel for the night. 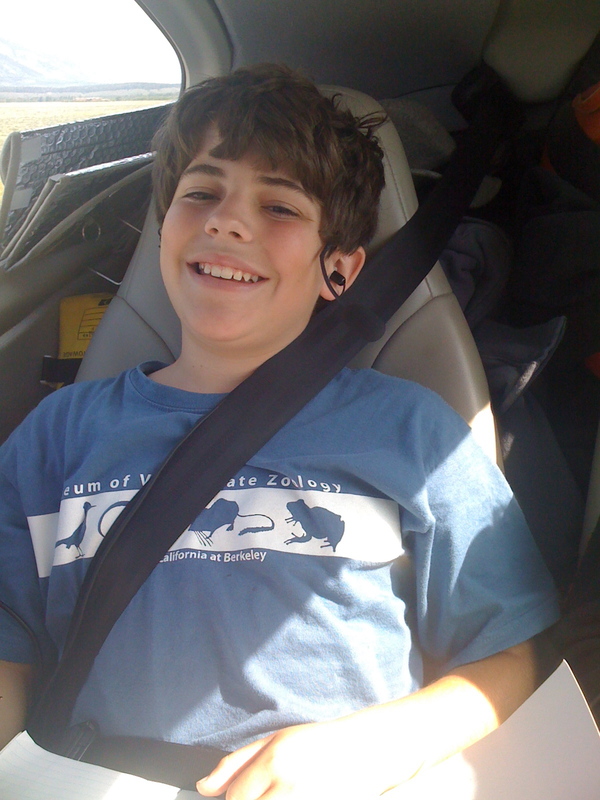 On the way back I called the FBO again. Was it raining there yet? Because it wasn’t raining where we were. No rain yet, and they hadn’t moved the plane yet. I asked them to hold off. We ran from the car into the FBO. Looking out the windows to the runway, I could see a wall of black clouds a few miles west of the airport, coming out way. I turned to the lineman who had helped tie down. “Do you think we can make it out ahead of that storm?” He glanced outside. I told the boys to race to the bathroom while I scooted out to the plane to do my pre-flight inspection. Even though we were in a hurry to depart, it was as thorough as it always is. Drain the tanks and check for water, check the oil level, check the movement of all of the control surfaces, wiggle the antennae to make sure they are all firmly attached… and so on all the way around the plane. Just as I made it to my door, the boys and Nell came running out. I looked out the window at the towering wall of black, menacing clouds over twenty thousand feet high, less than two miles from the airport. “East, very east.” He cleared us to take off immediately and we started our roll. We lifted off and I banked to the left before we were even halfway down the runway. In the image from the XM weather display you can see the storm, over fifty miles behind us by the time I was willing to take my iPhone out for a photo, chasing us east. it was hundreds of miles long north to south. We were eating up the distance at 180mph because of the tailwind. Once we were at cruising altitude I was able to figure out that in less than two hours we would be in Madison, Wisconsin. That’s a big enough (college) town that there were sure to be some decent hotels. We didn’t need dinner, since we were stuffed from Outback. Maybe a snack. And Madison delivered. It was dark by the time we made it there, and it was a little busy in the airspace around the airport. I was on my toes. Once we landed and walked into the FBO I realized that Oshkosh was still in progress. That’s the largest general aviation gathering on the planet, held every summer at Oshkosh, Wisconsin, an hour’s drive north of Madison. So there were more planes than usual parked, in the pattern and doing quick fuel turns to make their way up to the fly-in.